Everything about a margarita translates perfectly into a premium nail service. Lime juice is a natural fountain of youth. The citric acid in limes is a natural exfoliator and the peels help to inhibit melanin production, which can help to fade age spots. Tequila is a natural antibacterial agent, which gets an extra boost from salt — and what good margarita comes without salt? Nail salons from Mexico to Manhattan are hopping on the margarita bandwagon for manicures and pedicures. Tammy’s inspired service was driven by her need to create something different and unique for her guests and visitors to tiny Bingen (population 712). “Our clients will drive as far as 45 miles to experience the margarita services and come back again and again,” she says. Champagne and sparkling wines get their distinctive appeal from all those tiny bubbles. As it turns out, champagne has some unique benefits that make it a perfect choice for a premium nail service. Long thought to increase blood circulation when consumed, those tiny bubbles also act as a natural exfoliating agent. The active ingredients found in champagne-themed products may include grape seed oil or grape seed extract. These ingredients combine well with rose essence or citrus (think of a Mimosa — the popular drink made with orange juice and champagne) to enhance the aromatherapy value of the product and service. So pop the cork and offer your guest a glass of bubbly for a unique service. 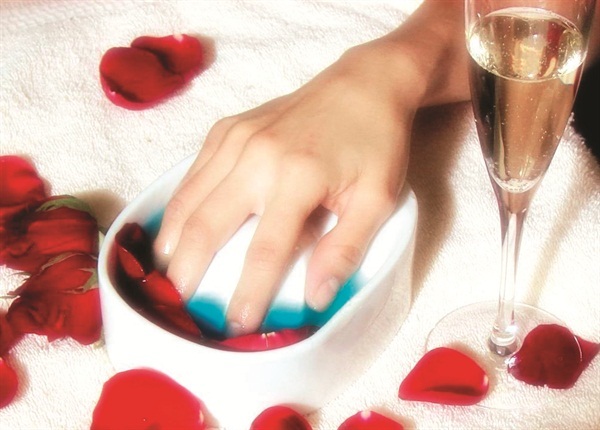 You will find many variations, but most champagne pedicures begin with a soak in room temperature champagne accented with rose petals or rose minerals. Grape seed scrubs are often used for exfoliation and can be combined with a champagne oil massage. The scrub combined with champagne oil creates the perfect combination of exfoliation and hydration. Champagne oil is helpful in restoring moisture and improving the look of aging feet while fighting skin discoloration. Vinotherapy combines traditional nail services and treatments with the antioxidant benefits of wine. Wine has been consumed for thousands of years. In fact, traces of white wine residue were discovered in King Tut’s tomb. 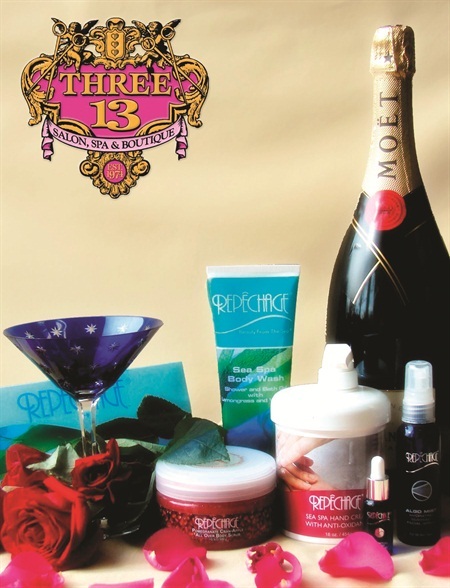 Nail services can feature wine as part of the protocol or in products. Wine, champagne, and grape seed products with enticing names such as Cabernet Crush, Merlot Magic, and Champagne Mimosa are readily available for back bar use and retail sale. If you are crafty, creative, or both, you might even try your hand at creating your own custom wine-based products. Wine consumption is a growing trend with wineries popping up in nearly every state. Wine-inspired services are tagging right along, not just for the fun factor but for the health benefits they deliver. Wine-based products may help to turn back the hands of time as they contain large amounts of concentrated antioxidants and vitamins. Nearly everyone has heard of the benefits of resveratrol, a natural plant phenol with anti-inflammatory properties thought to aid in wound healing. This service is loaded with health benefits as well. The yeast in beer is a natural antifungal agent, while the hops contribute anti-microbial properties and aid in relaxation. Barley is a natural anti-inflammatory agent that is loaded with zinc, which helps to repair the skin. The bran of the barley is a natural exfoliator. “Most people probably aren’t aware of the therapeutic benefits of beer; there’s more to it than just great taste,” says Jenna Walden, managing partner of Anjou. Annual sales of bourbon and Tennessee whiskey surpassed the $1 billion mark in 2013. Craft distilleries are cropping up across the country. Bourbon tours, tastings, and parings are becoming as popular as wine events. Bourbon is a uniquely American beverage that is found at backyard barbeques and black tie affairs. Given our love of bourbon, it was only a matter of time before salons and spas teamed up with product manufacturers to turn that delightful combination of brown sugar, vanilla, and caramel scents and flavors into a growing list of products and services. 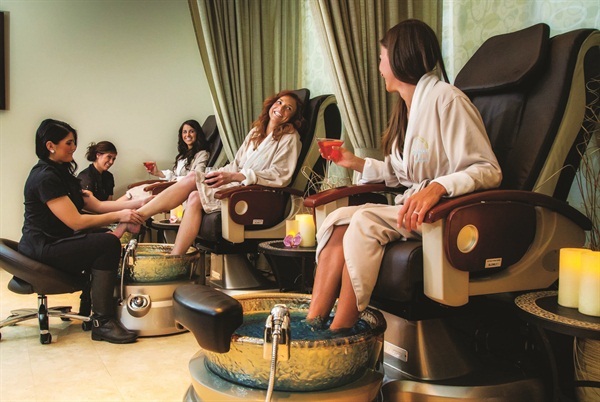 Spa Grand Traverse in the Grand Traverse Resort in Acme, Mich., has created an “On the Rocks” manicure and pedicure combination that features products infused with ginger, pecans, and real Kentucky bourbon. This service provides 100 minutes of “me time” and includes a complimentary cocktail. Spa director Dawn Olsen says her inspiration for the service came from guests’ positive response to having organic spa cocktails available in the spa. “Guests like the idea of relaxing with a delicious spa-inspired cocktail while enjoying our manicures and pedicures and at the same time catching up with the people in their lives,” says Olsen. An added plus is the fact that the Bourbon Bubbler products smell wonderful, which often leads to a retail sale. Our favorite spirits all have a national holiday or even a designated month. Use these red-letter days to promote your spirited treatments. Want to Add Some Spirits to Your Menu? Before launching into liquor-based services, some research is in order. 2. Seek out local sources for inspiration and products such as wineries, craft brewers, or vineyards. These local businesses can help promote your spirited services and products. 3. Brush up on the health benefits. Spirited treatments have many health benefits that can be part of your marketing and promotion punch. Explaining the health benefits of your services is an important component of what makes them special. 4. Test your recipes and practice your protocols. Consistency is critical in a premium service. 5. If you don’t wish to serve or use alcohol in your services, consider creating “mocktails.” Alcohol-free beverages are an option and there are substitutions you can use for the service ingredients. Patti Biro is the owner and founder of Patti Biro and Associates (www.pattibiro.com), a consulting firm specializing in planning and providing innovative coaching and education in the spa and wellness industry.